Start Creating Some Amazing Treats! 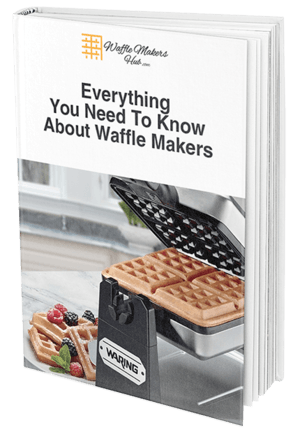 Download our FREE eBook guide and learn how waffle makers can make your meals taste better! At first glance, the Presto FlipSide Belgian Waffle Maker looks like a really great choice. The Presto costs around $40 (check the current price here) which is an average price for a waffle maker- not too high, not too cheap. The first notable feature is the timer on the side of the waffle maker which you can set to alert you when the waffles are done. This is in addition to the indicator light which simply tells you when the waffle maker is hot. I like any feature that takes the guesswork out of making waffles! The Presto FlipSide is a flip Belgian waffle maker which means once the batter is added, you flip the machine over to help the batter evenly spread. Unlike most flip waffle makers that can be bulky (such as the Black and Decker Double Flip), the Presto FlipSide lays right on the counter while cooking and can be stored upright, snapping securely into place with a tiny red clip. The waffle iron plates are very deep which will help make nice, crispy Belgian waffles. The plates are also non stick thanks to a chemical free, ceramic coating. The ceramic coating is PTFE free and will also never chip or flake- that’s always a good thing! The waffle iron plates should also simply wipe clean, no scrubbing needed! I plugged the Presto FlipSide in and the red indicator light went on to show that the waffle maker was heating up. After about 4 minutes, the light went off and the waffle iron was nice and hot. The silver top of the machine was especially hot so I was sure to only touch the ‘cool touch’ handles. I poured 1 cup of amazing waffle batter into the waffle maker, shut the top, flipped the waffle maker over and pushed the button on the timer three times as recommended by the Presto Manual (three to four minutes cooking time was suggested). After two minutes, the timer beeped twice which was a warning that the waffles only had one more minute to cook- I like a good one-minute warning! A minute later, the timer beeped multiple times and I opened the waffle maker to find a beautifully cooked Belgian waffle. The waffle easily came out of the waffle maker and did not stick to the machine at all. One cup of batter seemed to be the perfect amount as no batter spilled over the edges. Both sides of the waffle were golden brown and fairly evenly cooked. The waffles had a nice crisp crunch but were still very fluffy inside. Should You Get A Presto FlipSide? Yes! This is one of the best waffle makers that we have ever reviewed thanks to all the little bonus features. I love having a timer on the side of the machine that lets me know when the waffles are ready as I am always running around the kitchen while making breakfast- no more burned waffles! The ceramic plates are always a favorite of mine as I make waffles for my family and am wary of using machines that are made with PTFE (see the scary potential health concerns here). For around $40, the Presto FlipSide is a total win. Great big Belgian waffles in less than 5 minutes with a crispy outside and a fluffy middle- sounds like the perfect waffle to me! Still not sold? Read our Ultimate Buying Guide to see even more reviews and help you find the perfect waffle maker for you! I have a bachelor's degree for the Culinary Institute of America in Baking and Pastry Arts and over 16 years of food service experience. I also owned and operated a bakery cafe for several years. I have a two year old daughter who helps me write food blogs and articles as my official taste tester!